Let’s start with the basics. Our 3 Steps to SAT/ACT Success framework is a quick way to summarize how you should approach the entire SAT/ACT testing process. Determine the score you would like to reach based on your college admissions and scholarship goals. View average SAT/ACT scores of admitted students at a sample of nationwide colleges by downloading The Frontier 49 College Admissions Factbook. 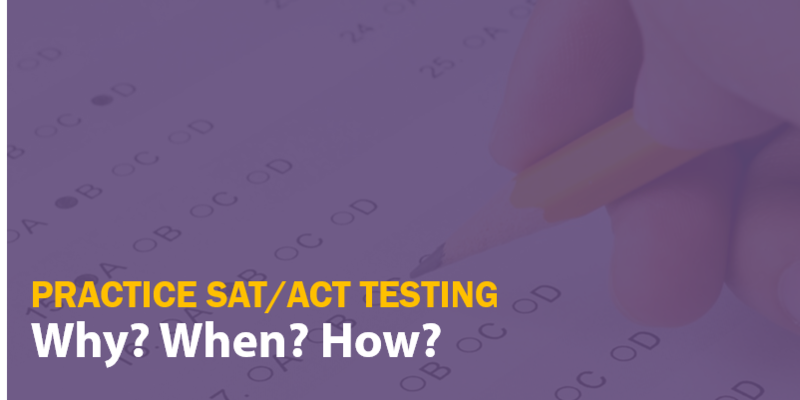 Want to learn more about the SAT/ACT testing process? Download our free e-book, The Ultimate Guide to Designing Your SAT/ACT Prep Strategy. Why Should I Take Practice SAT/ACT Tests? That’s Step 1 of the 3 Steps to SAT & ACT Success! At Frontier Tutoring (unlike at some other local providers), our practice tests are full-length and published by the test maker. While you can read about the differences between the SAT and ACT, the most reliable way to tell which test better suits your strengths is to take both, then compare your scores. We administer our tests using the same timing and type of directions you will hear on test day. It’s important for every student to experience what it’s like to test for over four hours straight—and develop strategies to stay sharp—before sitting for the real thing. We also administer our tests in groups (unless you schedule a custom time). You might be annoyed by another student’s allergies, the sound of cars outside, or the constant rustling of papers. But guess what? You’ll need to contend with those same distractions during the real test. A practice test is the right time to recognize what environmental factors challenge you and learn how to cope. Practice tests are low stakes (no stakes, to be precise). Taking a practice SAT/ACT provides you with the same experience and score accuracy as an official test, but you’ll save time and money, as well as avoid the risk of having to share a score you don’t like when you apply to colleges. Will Colleges Evaluate the Scores? Which Practice Test(s) Should I Take? Throughout this post, we’ve discussed taking both a practice SAT and a practice ACT so you can compare your scores. But what if you’ve already taken the official SAT/ACT, the PSAT, or a practice SAT/ACT within the last 6 months? Check out the table below to see which practice test you should take. Now that you know which practice test(s) you’re going to take, when should you sign up? 11th graders have the opportunity to take the PSAT every October, and the top 1% of Alaska students may qualify for National Merit Scholarship Program recognition or funding. If you are an exceptional academic performer and think you might have a shot at National Merit, we recommend taking a practice SAT and ACT during the spring of sophomore year or the summer before your junior year. We can tell you if earning a National Merit qualifying score is a realistic goal, and if it is, you’ll have time to study. Learn more about the PSAT and National Merit Scholarship process for Alaska students by downloading our free e-book, The PSAT Pathfinder. We generally recommend taking the official SAT or ACT for the first time during the spring semester of your junior year. By this time, most students will have covered the math and language arts content tested most heavily on the SAT/ACT. And taking the official test in the spring of your junior year will allow you at least one or two additional testing attempts early in your senior year if you want to retest. With that in mind, you should take your practice SAT/ACT the summer before your junior year, or otherwise sometime during your junior year. That will give you time to determine which test better suits your strengths, establish your baseline score, set your target score, and prepare for the official test if you need to. What Should I Do After the Practice Tests? After you finish your practice SAT/ACT, your first step is to compare your SAT and ACT scores to determine whether to focus on the SAT or ACT. Use the concordance tables in The Ultimate Guide to Designing Your SAT/ACT Prep Strategy to compare your SAT and ACT scores and see which test you performed better on. Determine your target score based on your college admissions and scholarship goals. View average SAT/ACT scores of admitted students at a sample of nationwide colleges by downloading The Frontier 49 College Admissions Factbook. You can also sign up for North to My Future, your free, individualized college admissions strategy session, where we can help you determine your target score. Evaluate your baseline score and target score in the context of your strengths and learning style preferences. Determine whether you should go pro with an expert test prep program, study on your own, or try both. Ultimate Guide to Designing Your SAT/ACT Prep Strategy has some tips on deciding among these options. We can also address the best test prep program(s) for you during your North to My Future meeting. Finally, you can always contact us for direct guidance. Now that you know the best way to take advantage of resources, sign up for your free practice SAT/ACT now. And, of course, we welcome you to contact us anytime with questions regarding your individual academic, testing, or college admissions situation.